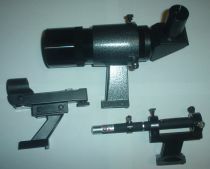 Not so long ago, finders were little straight-through refractor telescopes and your only choice was the size. Today we have many more choices, and while personal preference is a major factor in picking a finder, not all finders work equally well when faced with light pollution. When dealing with significant light pollution, I've found that a green laser finder combined with a traditional finder-scope works best.